We have created this guide to make it easy to find the best souvenir and gift offerings in and around Kinkakuji, Ryoanji, Ninnaji and Myoshinji. Gift shops on the temple grounds as well as the other local outlets in the area of the Kinukake-no-michi road are listed on the Souvenir and Gift Map so that visitors can see who is selling what at a glance. 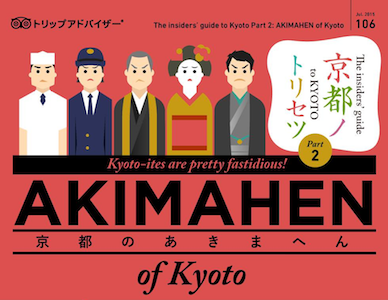 Feel free to use it in planning your trip to Kyoto before you come, or to search for the perfect memento as you stroll along Kinukake-no-michi. This map helps makes shopping more convenient by showing where the stores are located relative to area attractions. Feel free to use it in planning your trip to Kyoto before you come, or to search for the perfect memento as you stroll Kinukake-no-michi Road. We asked celebrity mascot Kinukake-san to curate the souvenirs and gifts that a traveler can only purchase at the World Heritage sites on Kinukake Road. 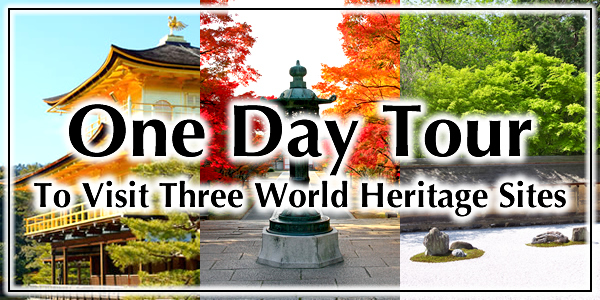 All three temples – Kinkakuji, Ryoanji and Ninnaji – symbolize Kyoto to the world, and each offers a variety of unique gifts that capture the Kyoto experience, available exclusively on the grounds. On this page, Kinukake-san shares his slightly quirky recommendations for the most thoughtful (yet reasonably priced) choices at each location. Meika Kinkaku is an original cake creation from the bakers at Senbon Tamajuken. The bakery is located in the Nishijin district of Kyoto, which is famed for its tradition of masterful craftsmanship. While several other unique mementos of Kinkakuji are offered at the gift shops, none is a better choice than Meika Kinkaku cakes when it comes to capturing the essence of the temple. Likenesses of Kinkakuji and Mount Kinugasa are impressed onto the surface of these small delights, accompanied by flecks of gold leaf created from hard rakutan candy. The cakes are filled with sweet bean paste of Daitokuji natto, the dried and salty fermented soybeans prepared from a traditional recipe by the monks of the Daitokuji temple. With just the slightest hint of salt, Meika Kinkaku is an exquisitely sophisticated cake of understated sweetness. Guests at the rest area in front of the Fudodo Shrine are invited to enjoy a taste of Meika Kinkaku, served with every bowl of matcha green tea. Meika Kinkaku gift sets come wrapped in an elegant Chinese phoenix design which – like the flavor of the cakes – hints of the golden majesty of Kinkakuji. Finding the perfect memento of a trip to Ryoanji can be a daunting task. The Kuri Gift Shop offers an expansive original lineup, from bottle openers in the form of the temple’s famous tsukubai water basin to rock garden paperweights. However, nothing beats the Sekitei Tenugui for practicality, space saving on the trip home, and especially price, at just 450 yen. More than a mere souvenir, it is an apt commemoration of your Ryoanji experience, and thus may be an even better gift for yourself than friends and family. Throwback chic is definitely a thing in Japan now, and it doesn’t get any more hip than wrapping an old-school tenugui　around your neck for a walk on a hot day. With its timeless design that whispers rather than shouts, the Sekitei Tenugui is Zen Cool. A Ninnaji Temple original, Fu Senbei are finely finished and sweet but subtle, like Kyoto itself. Japan's royal seal,the famous Chrysanthemum Crest, graces the individual wrapping around the senbei crackers in the gift set, reflecting the history of Ninnaji as a Monzeki Temple, whose abbots traditionally have been selected from the Imperial Family. Fu Senbei are served in the tearoom at Ninnaji, selected for their perfect harmony with the flavor of the green tea. As the faint savory touch and light sweetness of the delicate senbei dissolve in the mouth, the gustatory experience is as refined as Kyoto. Fu Senbei is made by Kameya Shigehisa, the appointed purveyor to Ninnaji. They also sell another handmade roasted bran senbei at their shop, located just in front of Myoshinji Temple. Known as Omuro, it draws its flavor from sugar of the yuzu, the citron-like fruit native to Japan.